This is a continuation of the SunGuide® software series, started last month. In the previous article, we talked about how SunGuide software can help identify incidents. In this article, we will discuss how SunGuide software can help manage incidents after the incident is identified. We will also describe the comprehensive approach used by SunGuide software for event management. Traffic congestion and crashes are a significant problem on roadways. Florida’s interstate system comprises about 1.7 percent of the state’s roadways, but it carries about 24 percent of all roadway traffic. Because of this, congestion on Florida’s interstate system has steadily increased over the years. Traffic-related events, particularly those that block travel lanes, can restrict the flow of already congested traffic and significantly increase travel times for motorists. Along with increasing travel times, these events add to motorist frustration and road rage, which can contribute to unsafe driving conditions. Therefore, it is important for transportation management center (TMC) operators to manage traffic effectively and ensure that travel lanes are cleared efficiently so that traffic can return to normal. So how do TMC operators use SunGuide software to manage incidents in Florida? Once the TMC operator learns of an incident, the operator confirms it by monitoring closed-circuit television (CCTV) cameras in the vicinity to view the incident, or by requesting a Road Ranger service patrol or law enforcement personnel to visit the incident site. TMC operators usually prefer visual confirmation of an incident as it helps in not only the confirmation, but it also provides additional details on whether the incident is impeding traffic, if any motorist is injured, and if they need to contact other agencies to assist with the incident. 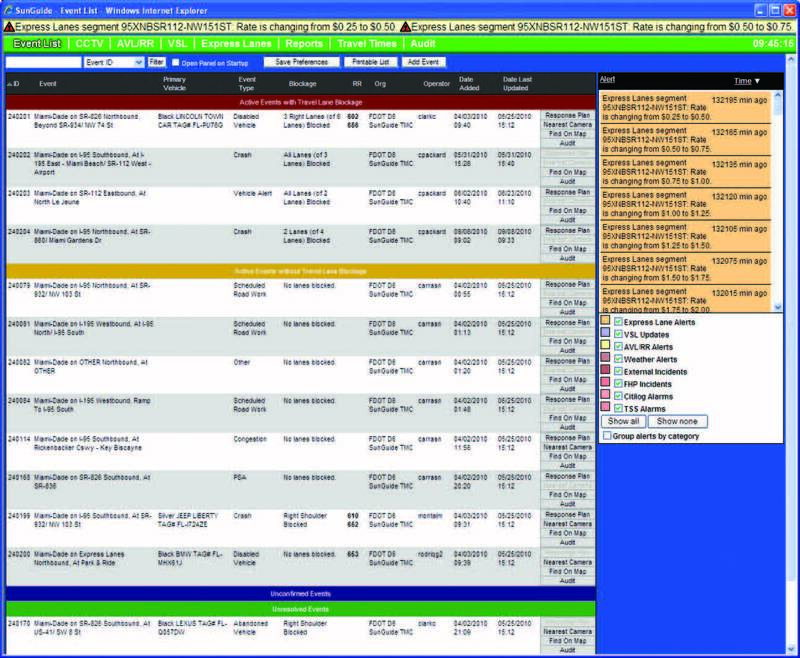 The TMC operator would typically create an event in the SunGuide software to track and log information about an incident. Information entered in for the event includes when the operator first learned of the incident and when and how they confirmed the incident. The software also asks about the incident location and the type of incident. The software has extensive options to enter additional information; however, it does not require entry of all information up-front. The TMC operator can enter some information initially and continue to fill in other information as the incident progresses. Using information added to the event screen, the software recommends an information dissemination plan. This includes posting incident messages on dynamic message signs (DMS), highway advisory radios (HAR), and Florida’s 511 traveler information system (FL511), together with broadcasting email to District operations personnel. SunGuide software is able to determine the DMS and HAR devices in the vicinity of the incident and can also recommend the message to be included on these devices. This not only makes it easier for the TMC operator to disseminate incident information, but it also makes it faster to broadcast the information. We believe that any time saved in trying to navigate through the software is time better spent in managing the incident. • They change the message broadcasted to the motorists as the number of blocked travel lanes changes. • They track the number of responders on the scene and their arrival / departure times. • They dispatch Road Rangers to the incident, depending on the severity and other priorities. As they track an incident, TMC operators log all information in the SunGuide software. This allows TMC managers to analyze how incidents are managed in their jurisdiction and to make any adjustments to their procedures to more efficiently manage incidents. Having all incident information logged in the software also allows TMC administrators to perform a quality check on the incident information. It is important to ensure the accuracy of the information disseminated on the DMSs, HARs, and FL511. Based on the Florida Department of Transportation’s (FDOT) past experience, we know that the traveling public can easily lose confidence on broadcasted messages if they see inconsistent information; so it is critical for TMC operators to closely monitor incidents and ensure the accuracy of broadcasted messages. SunGuide software is able to automatically recommend messages and pre-select the DMS and HAR devices to send messages to because of its ability to be customized. The software is customized to recognize which DMS is upstream and which is downstream. Also, the software is customized to provide a tailored message, depending on whether the DMS is on the same roadway as the incident or on a different roadway, or if the incident is on the ramp. The SunGuide software map shows all the active incidents in the TMC’s jurisdiction. This makes it convenient for TMC operators and administrators to view all incidents in the system. Icons indicate incidents by type. If it is a minor incident, the icon is green with the number “1” within the icon; but if it is a major incident, the icon is red with the number “3” within the icon. The number within the icon refers to the severity of the incident. Similarly, other incident types are differentiated by the color and text within the icon on the map. The icon also reflects if the incident information has been disseminated to DMS and FL511. Now-a-days, most Road Rangers use a mobile device to facilitate direct interaction with SunGuide software. TMCs have either purchased a vendor- or FDOT-developed mobile application product. These mobile devices used by Road Ranger are connected to the SunGuide software system at the TMCs to make it easier for TMC operators to collaborate with Road Rangers. This system not only transmits real-time location updates from the Road Ranger vehicle, but also allows the Road Ranger to enter incident information into SunGuide system software in the field. This saves time for TMC operators as they do not have to be on the phone with the Road Ranger to enter incident information into the software. As shown in this article, SunGuide software offers the flexibility to manage incidents efficiently and effectively. Given its ability for customization, this software offers recommendations that are consistent with the users’ preferences and the TMC’s objectives and procedures. Also, given the business intelligence built into the software, it is able to disseminate information with minimal operator involvement, but with complete oversight. Most of the features in the software are designed to save TMC operators time and effort so they can focus on other important things related to incident management, such as coordination with law enforcement and other TMC personnel.